This beautiful, energy-efficient home is often mistaken for a period property that has been carefully restored. In fact, the house is a no-expense spared self-build that pays respect to the old cottage it replaced. Owners Peter and Auriel Rolling began their “Grand Design” in 2016 after buying a derelict cottage in the pretty hamlet of Gawthorpe, near Huddersfield. 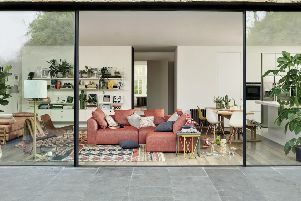 “It had planning permission for a conventional house with two garages but we redesigned it so that one of the garages became additional living space. “We also wanted to follow the line of the old cottage to pay reference to what was there before,” says Mr Rolling. The five-bedroom house is built from from stone with a Yorkshire grey slate roof. “A lot of people say the house looks like it has been there a long time and that was the idea,” says Mr Rolling, who is selling to downsize. The property, which featured Grand Designs magazine, has a hall, cloakroom, w.c, sitting room, living/dining kitchen, utility room, five bedrooms and three bathrooms. Gawthorpe is a 10 minute drive from Huddersfield and a 15 minute drive from the M62.